Recently my family spent a week in one of the most golf rich (literally?) areas in the United States: Carmel, California. It was a family trip but when you head to the Monterey Peninsula you must bring your clubs, I’m told it’s a law..or a statute...or something. I knew I’d have time for one full round with some supplemental play at the Pebble Beach Par 3 course: Peter Hay. The weather was less than ideal but far superior to the snow covered conditions of Alaska so you’ll hear no complaining from me. 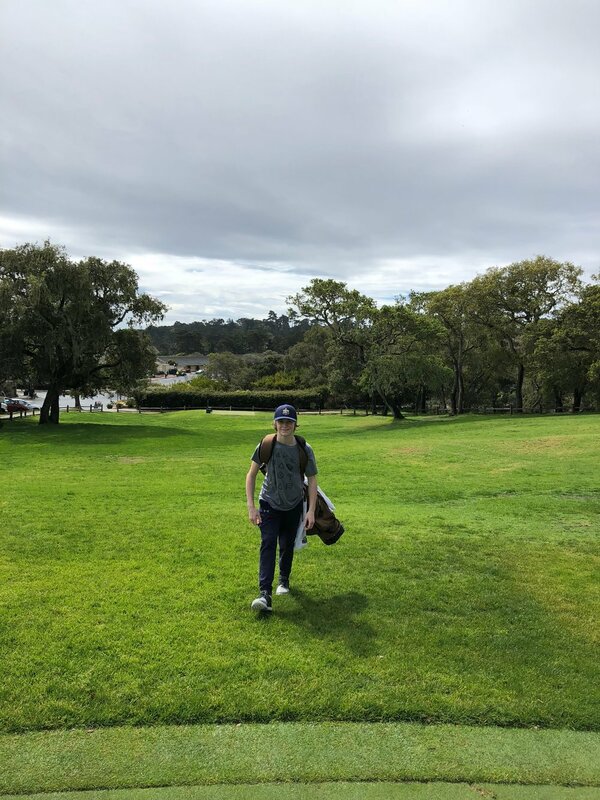 All total, we managed four separate outings: a few loops at Peter Hay, a full round at Poppy Hills, and an emergency (back) 9 at Pacific Grove Golf Links. With no hole measuring longer than 105 yards, this course is a pitch and putt fit for the whole family. The boys (ages 13 & 11) and I managed to play two loops in less than two hours and came back the next day for a bonus loop. Peter Hay isn’t as picturesque or challenging as other par 3 resort courses but it’s free for kids under 13 and only $10 for kids 13-17. It’s a wonderful introduction to the game and/or a great way to spend an hour. It lacks the intimidation of a big course and provides the opportunity to practice a variety of short game shots. I’d be curious to know how much a course like Peter Hay would cost to build and maintain. It’s simplistic enough and takes up very little acerage. I asked my son how often he would play the course if it were at the park near our house. He said at least 5 days a week, including several loops on the weekends. That speaks volumes for what a course like Peter Hay could do to help “grow the game.” So attention all Park and Recreation departments, build a Peter Hay and they will come! Before I discuss the round I need to provide some free advertising for Youth On Course. YOC is an organization that provides life-changing opportunities through golf. YOC affiliated courses provide dramatically reduced rates for kids ages 6-18. Poppy Hills is the home course for the organization and as a result my boys were able to sign up and play for $5.00 a each! This was not our first visit to Poppy Hills. In 2014 my dad and I took the boys, then 9 and 7 out to play. At that time my boys were just getting introduced to the game and only played the par 3 holes and pitched and putted on a few others. It was their first time on a “real course” and they were excited. I had played Poppy back in the early 2000’s, before the renovations, and revisiting in 2014 it was almost unrecognizable in the best way possible. It played fast, firm, and challenged every aspect of my game. My boys were able to slap low hybrids and watch them run up to the green, providing a feeling of success and enjoyment that I credit with getting them hooked on the game. Our group consisted of myself, my two sons, and a quasi-local who doesn’t get out to the course very often but wanted to spend some quality time with his son and grandsons: my dad. My eldest son and I walked and my younger son rode in the cart with his Papa. None of us had touched a club, other than putting in the basement, in months so our games were a bit rusty but that didn’t deter us from having a great time. With wide fairways and short grass around the greens, Poppy Hills is a course that tests but also allows for creativity. I took that a step further and only brought nine clubs with me (Driver, 3 metal, 3 hybrid, 5-7-9 irons, two wedges, and a putter). I was between clubs on quite a few occasions and enjoyed it every time. It made for a lighter walk and a fun round. My sons battled mid-winter inconsistencies but once they settled down they had some impressive shots and enjoyed the round. Simply put Poppy Hills provided a backdrop for a 4-hour outing with my sons and my dad and I couldn’t be more grateful. Often referred to as the “Poor Man’s Pebble,” Pacific Grove Golf Links is the worst kept secret on the peninsula. However, people often come to these parts with tee times booked six months in advance on highly rated courses or better yet they’re enjoying the exclusivity of some of the country’s finest private clubs. We were doing neither of those so when my wife went on a hike with her best friend and my dad offered to take my daughters to a movie I only had one call to make. It was 2:00 on a Saturday so my hopes were not too high but as luck would have it the tee sheet was open. We wasted no time and and headed straight for PG. Once we arrived I asked the question every hopeful golfer asks when they arrive at PG...can we play the back? The starter peeked out of the shop and saw a twosome putting out on 9. He said the magic words, "Just follow that group." For those that don’t know, the two 9s at PG are drastically different. The front 9 is played out amongst the neighborhood that bears its name while the back 9 is across the street along 17-mile drive with the lighthouse (logo) looking over every hole. Perfect in its own way, the back 9 at PG is filled with short holes, blind shots, shared fairways, and ocean views. This is the kind of course you’d want to call home, I know I would. Not the birdies we were looking for. Carmel, California is a small village sheltered from the hustle and bustle of normal life. A local said, and I quote, “we enjoy our little bubble.” For one week in March we called it our home and enjoyed ourselves on and off the course. This week proved to me that while the big ticket courses can be enticing and the prestigious enclaves of Cypress Point and MPCC can lead people to contemplate trespassing, this “bubble” has more to offer and can be enjoyed by the whole family. Carry On everyone and Enjoy Golf.